Taysom Hill is a multi-talented football star currently associated with the New Orleans Saints of the National Football League. Despite losing out in the 2017 draft because of an injury-filled college career, Hill has wangled his way into the league and is now one of the playmakers in the Saints’ team. Interestingly, Taysom is a multi-purpose player; he has the ability to fill in any position either as a kick returner or running back. He completed his college career at Brigham Young University. Taysom Shawn Hill was born on the 23rd day of August 1990 in Pocatello, Idaho, in the United States. He was born to American parents Doug Hill and his wife Natalie. The NFL player was named after the Taysom Rotary Park situated in his hometown in Idaho. Hill was raised along with his three brothers – Celeste, Dexter, and Jordan Hill. Sadly, he lost his older brother Dexter in March 2016 after a brief illness. Dexter’s death affected him so much as it was Dexter who mentored him in the game of football. As a chap, Taysom enrolled at Highland High School where he kickstarted his career in football. There, Taysom was a three-sport athlete; he competed both in football as well as basketball and other track events. In his senior year in 2009, he completed 2,269 passing yards with 18 touchdowns. As a result of his outstanding performance, he got several accolades including Gatorade, All-Idaho, All-Conference, and All-Region Player of the Year Awards. Soon after his graduation, Taysom enrolled at the Brigham Young University for his youth career. Prior to the inception of his college career, Taysom who is a member of The Church of Jesus Christ of Latter-day Saints was assigned to serve as a missionary in Australia from 2009 to 2011. Upon return to the US, Taysom continued his football career at the Brigham Young University. Unfortunately, he was plagued by injuries throughout his college career and was unable to keep a significant record. In his freshman season in 2012, he was made the second string quarterback and after making six appearances, Taysom incurred a knee injury which ruled him out for the rest of the season. As a sophomore in 2013, Taysom became the starting quarterback for his team. Nonetheless, the injury-prone quarterback ended his second season as a result of a leg injury. Undeterred, he returned to the football field after his recovery and during their 2015 season-opener against Nebraska, the quarterback sustained another injury on his foot which kept him away for the whole of 2015 season. In 2016, he experienced a hyper-extended elbow injury which brought his college career to an end. Coming from a rather unsuccessful collegiate career, Taysom Hill was not invited for the NFL draft combine drills. He featured in his school’s Pro Day where he showed a lot of athletic ability in front of the NFL scouts. After the 2017 NFL draft, the utility player went on to sign up with the Green Bay Packers as an undrafted agent. He featured in the Packers preseason games where he made 14 passes with two touchdowns. He was dropped by the Packers prior to the beginning of the 2017 season. 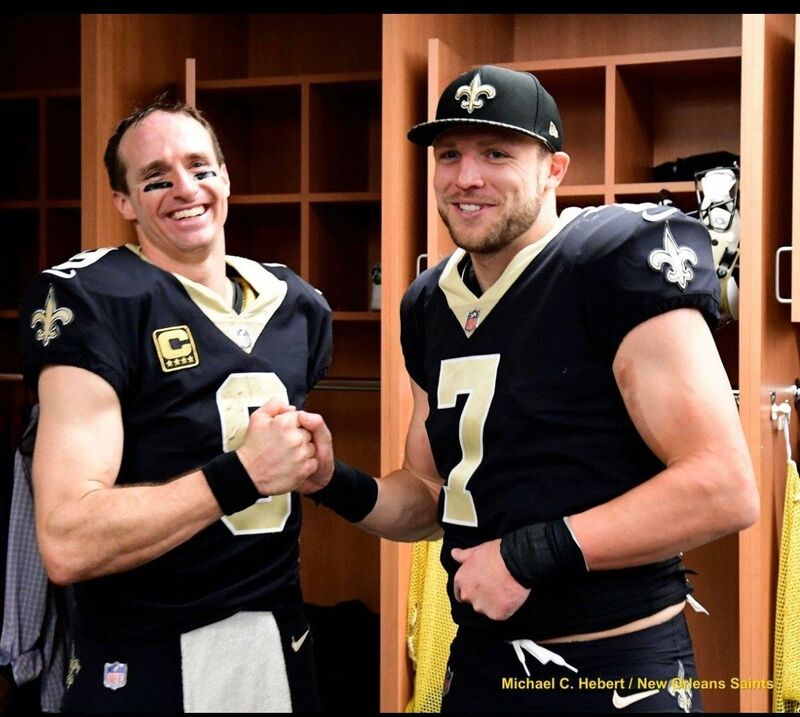 Shortly after that, Taysom was recruited by the New Orleans Saints and he made the starting squad in December 2017. He played his first professional game against the Carolina Panthers. During the game, the player made two tackles against a Panthers’ kick returner. The following season, he was made the third-string quarterback for the team and he played in alternating positions both as a kick returner and running back throughout the 2018 season. Amazingly, Taysom has continued to improve in his game and still has more time to prove himself in the league. Although Hill is yet to be at his best, he has earned a reasonable amount of wealth from his football career. He made $465 thousand in 2017 and in 2018, he earned $555 thousand from his stint with the Saints. His next successful season with the Saints would see the player pocket $645 thousand. Apparently, his net worth is still under review and can’t be ascertained at the moment. Taysom Hill is married to his college sweetheart and the love of his life, Emily Nixon. Emily is the sister of the former NFL star, David Nixon. There is no much information regarding her background and educational history. Just like Hill, Emily also attends The Church of Jesus Christ of Latter-day Saints. The lovely couple met each other back in college and after a few years of a successful relationship, they tied the knot in 2014. Their wedding took place at the Salk Lake Temple in Utah, United States. The couple doesn’t have kids yet.